While fabricators overall have a positive perspective for the upcoming year, it appears they are a little more cautious than their predictions for 2016, according to Stone World’s annual purchasing plan survey conducted by the Market Research Department at BNP Media (Stone World’s parent company). The survey polled fabricators from small-, medium- and large-sized shops located across the U.S., and three-quarters of the respondents have high hopes for 2017 — with sales revenues expected to grow next year by an average of 17%. While this is a 10% drop from the 86% who believed last year would show growth, it is still a hopeful sign that 2017 will be a good year for many. The recent survey showed a total of 76% expect sales revenue to increase in 2017. Another 23% said it would remain the same (up 9% from 2016’s predictions), and 2% believe that there would be a decrease in sales revenue. The mean average of 17% growth has also been the mean for the past three years. There are a combination of factors attributing to the positive market perception, including increased construction, better housing market and the improving economy. Additionally, several fabricators believe their increase in marketing/sales efforts and a surge in quartz sales are also contributing to more business. 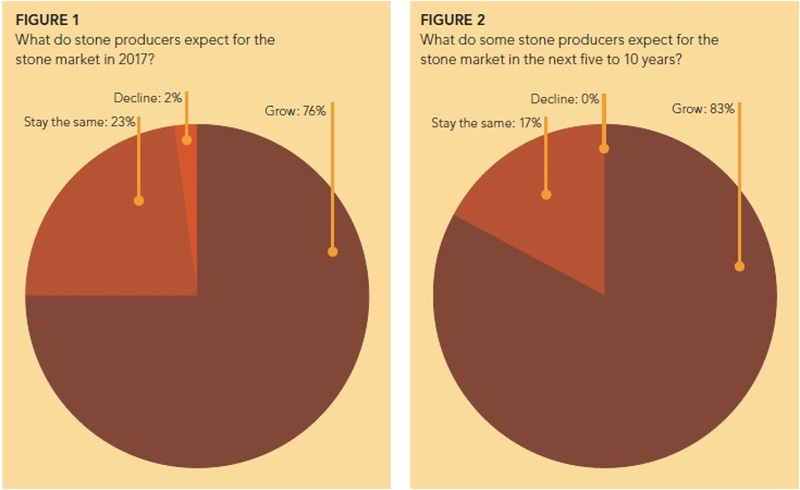 There was a positive response among fabricators participating in the Stone World survey when asked about the direction of the stone market in the next five to 10 years. A total of 83% believe the market will continue to increase by an average of 19%, while only 78% of last year’s respondents said it would increase. A total of 17% said the stone market will stay the same during the next five to 10 years, and no one believes there will be no expansion, as opposed to the 6% of last year’s respondents. Among those who did express long-term optimism, there were a variety of explanations for why they believe the stone market will continue growing during the next five to 10 years. Economic development, economic growth due to corporate tax reductions and a rise in the construction/housing market were among the general sentiments. “I think the current building and remodeling trends will continue on their steady increase in the years to come,” said one respondent. “There’s not a compatible material in the market to hinder stone counter sales,” said another.